While I was in Miami last week I went to dinner with Judge Alex. He lives there. My friend Mark works in development for Twentieth Television, the syndication division of Fox Television, and "Judge Alex" is one of the shows he helped create. 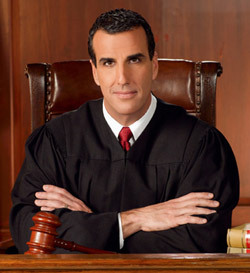 Click here to watch a promo for Judge Alex. Another show Mark is creating (which is actually the reason he was in Miami last week) is "Cristina's Court." There's a blurb about it in today's New York Post. It's premiering next month, so check your local listings. Mark is also working on two new primetime novellas called "Fashion House" and "Desire" for myNetworkTV (a new Fox station.) Dynasty lovers take note - both sound juicy! Read this article to get the gist of what a novella is, as well as find out why "Fashion House" is going to be awesome. When you're done, watch the promos for "Fashion House" and "Desire".